‘When I was a kid I was lucky to have a week at the seaside in a caravan in the rain.’ How many times have you heard that? Or even said it yourself?! The kids of today, unlike their parents or grandparents, expect to travel abroad for their holidays. Even very young babies are taken to Tenerife, Florida or Ibiza. In many of the most popular tourist-orientated resorts you’ll find restaurants that offer British favourites - steak and chips, burger and chips, pizza and chips, spaghetti bolognaise – but even those won’t necessarily be exactly the same as you get at home. But it would be a shame if they missed out on the whole experience of tasting authentic foreign food. 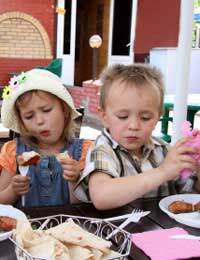 Surveys generally suggest that your kids will be more welcome and treated better in restaurants abroad. Holiday time is a great opportunity to test this theory! You’re likely to be more relaxed and better able to deal with situations on holiday, especially if you know your kids are as prepared as they can be. As in most things, beginning early and at home is the best way. They’re most likely to respond positively in a safe environment where they’re used to being offered different flavours. In the same way that traditional British food doesn’t taste quite the same abroad, so your attempts at creating foreign dishes will differ from the genuine article. The important thing is to get your child used to the idea that there are lots of flavours and textures out there, and that food is an adventure to be enjoyed. Don’t make a big deal of it. Introduce paella, for example, as you introduced potatoes or cereal: a little at a time. Don’t make a point of saying that it’s foreign food; even without completely understanding the word, the child could pick up on the implication that it’s something very different and that he might not like it. All food is foreign to the child who hasn’t yet tasted it. When abroad, do encourage your kids to try local dishes. As well as being an education for their palate, with their inclusion of fresh produce, they tend to be healthier than the typical fast food options, as well as better value. If you’re camping or caravanning overseas, and you’re doing some or most of the catering yourself, take the kids with you when you go to the supermarket. Let them help you choose, especially from the fresh fruit and vegetables, meat and fish departments. See what’s different and what fresh herbs or spices are available. Foreign bread is often a delight. Nowadays you can buy baguettes, ciabatta and bagels from your local supermarket but there’s something very special about eating the bread in the country of its origin. Especially with some of the local goat’s cheese, salami, olives or tomatoes still warm from the sun. It might be a good idea, if you know your daughter won’t eat anything except rice pops for breakfast, to take a large box with you. The same goes for baked beans or tomato ketchup. Although these items are often available, the brand-names you’re familiar with will be expensive. Pack some snacks and drinks for the journey. Although airlines provide meals and sell snacks, it’s a good idea to have some favourite goodies on hand. Similarly with ferry or train journeys: to a small child they can seem to last for ever. Wet wipes for sticky faces and hands also come in useful. Which has taken us a long way from the subject of foreign food! As we said, all food is foreign to the child who hasn’t yet tasted it. There’s no reason why one food should be a bigger deal than another. Each one is another step on the learning curve and along that curve will be foods that your child simply doesn’t like. Don’t worry about it! If you’re on holiday and your efforts have proved to be in vain and your child refuses to eat anywhere except at the local McDonalds, don’t worry: it’s only for a week or two. It’s not going to hurt her!